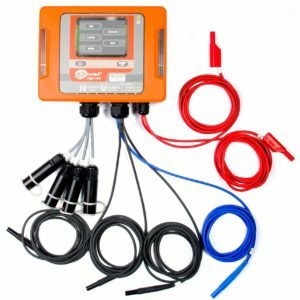 Power Quality Analyzer PQM-700 (Fig. 1) is a high-tech device providing its users with a comprehensive features for measuring, analyzing and recording parameters of 50/60 Hz power networks and power quality in accordance with the European Standard EN 50160. The analyzer is fully compliant with the requirements of IEC 61000-4-30:2009, Class S.
The device is equipped with four cables terminated with banana plugs, marked as L1, L2, L3, N. The range of voltages measured by the four measurement channels is max. ±1150 V. This range may be extended by using external voltage transducers. Current and voltage events registration including wave forms and RMS graphs half period. Power Quality Analyzers PQM-702 is a high tech devices providing users with features to measure, analyze and record parameters of 50/60 Hz power networks and power quality in accordance with the European Standard EN 50160. Analyzers are fully compliant with the requirements of IEC 61000-4-30:2015, Class A. Power to the analyzer is supplied from tested mains (internal power supply) and is used in all types of networks from 64 V to 760V. With particular emphasis on measurements at low voltage poles, due to the ease of connection. Has an independent power supply socket, especially suited for voltage measurements for transformers and DC circuits. Remote control and data transfer through a built-in GSM modem (GPRS). Anti-theft feature - SMS notification in the event of position change - built-in GPS receiver. Real-time clock synchronized to GPS protocol. Current and voltage wave forms recording after each averaging period. Power Quality Analyzers PQM-703 analyser include all features of the PQM 702 but with extr,a functionality to measure; Mains signalling up to 3000 Hz, Transients up to ±6000 V, minimal transient capturing time is 650 ns. This is is a technically advanced product that allows for comprehensive measurements of the quality of electricity, analysis and recording of power network parameters, for frequencies 50/60 Hz, in accordance with the European Standard EN 50160. Analyzers are fully compliant with the requirements of IEC 61000-4-30:2015, Class A.
Mains signalling up to 3000 Hz. Transients up to ±6000 V, minimal transient capturing time is 650 ns. Current and voltage waveforms recording after each averaging period. 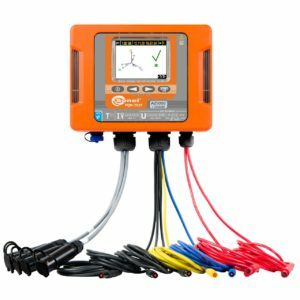 This power quality analyzer measures, analyses and recording of network parameters 50/60 Hz and the power quality diagnostic according to European standard EN. PQM-710 is an innovative model with Wi-Fi, which allows for automatic pairing with included tablet with a large 10" touch. 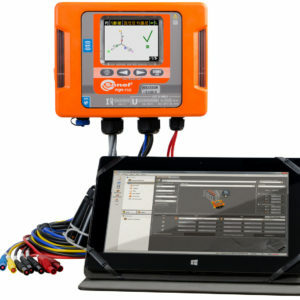 The tablet allows full remote operating of the analyzer, live data preview and the reading and analysis of data stored in the internal memory. With this solution, the PQM-710 is an unique device that combines the advantages of an analyzer with built-in display and typical portable analyzers (also knows as Black Boxes). With the tablet you can very quickly checked the device under test. You can also leave the analyzer module as a typical logger without display for multi measurements You can very efficiently diagnose the machine under test using the tablet. Analyze is targeted to a wide range of users who need to monitor the power quality with a mobile device, it meets the IEC 61000 standards for Class A.\ and compliance with the standard includes measurement uncertainty, measurement methods and time synchronisation with a reference signal. In case of poor GPS signal, additional antenna with 10 meters cable can be used to be used for internal clock synchronisation. In practice, the analyzer may be used with all network types with rated voltage from 110 V to 760 V, directly or indirectly via transducers. With those features PQM-710 can be used in power industry and industrial maintenance services, as well as in companies leading network analysis services. The MPI-540 meter is designed for checking home and industrial electrical installations. Measurements taken by this device, provides results to determine the safety of the installation. The user also has the possibility to register the parameters of electrical networks location at these facilities. This allows verification of the quality of electricity, and measurement of the parameters of protection against electric shock using a single universal device. This superior meter combines the measurement capabilities of several devices, while ensuring equally and accuracy. Significant automation of measurements with the meter makes it possible to test functioning of residual current circuit breaker in the auto mode, as well as in pre-programmed measuring sequences (so called auto-tests), which can also be extended with own sequences. Automatic measurement of insulation resistance of 3-, 4- and 5- wire conductors is possible by using additional the AUTO ISO-1000C adaptor. This Power Quality Analyzer is an autonomous meter allowing for versatile measurement, analysis, and registration of energy networks parameters DC and 50/60Hz. This includes the quality of electric energy in accordance with the European standard EN 50160 and the Regulation of the Minister of Economy on detailed conditions of the electro-energetic system functioning. To Guarantee highest of accuracies all parameters are measured in the S class of the IEC 61000-4-30 STANDARD. This is the largest in this class of power quality analyzers with 7-inch colour touch screen enables intuitive and ergonomic operation. 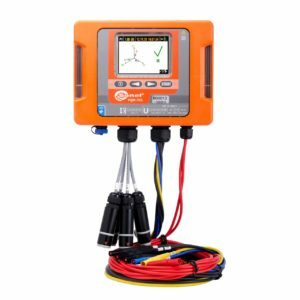 Thanks to the built-in lithium-ion battery, the analyzer allows for efficient work during the measurement without the necessity of connecting an external AC adapter. The analyzer can be used directly, or indirectly via transformers in virtually all kinds of networks with rated voltage from 54V to 760V. Due to its mobility and autonomy, any problems occurring in the supply networks can be diagnosed on the spot. With a good safety rating of (CAT IV 600V) the Power quality analyzer provides peace of mind during every day use. 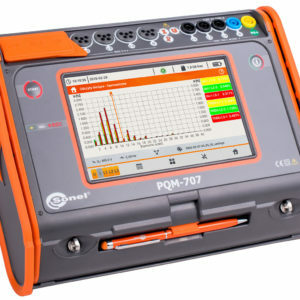 The PQM-707 can therefor be used in the field of professional power engineering, maintenance services in industrial plants, as well as among those providing services focused on network analysis. The PQM-707 power quality analyzer is equipped with a readable colour, 800x480 pixel, touch-screen which provides high comfort of interaction and easy readability of the measurement results. Analyzer measures and record according to the IEC 61000-4-30 class standard.